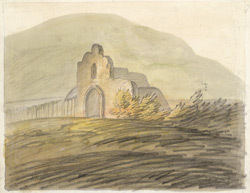 Watercolour and pencil view showing a gateway of a palace at Halling in Kent. The Bishops of Rochester had a residence here during the middle ages, therefore this view is of an Episcopal, not a royal palace. Firstly Bishop Gundulph of Rochester built a palace there in 1077, near to the parish church which had already been established in Anglo-Saxon times. During the 16th century it was the home of William Lambarde, author of 'A Perambulation of Kent' in 1576. By the 19th century, the Bishop's Palace was used as a farm house, then finally demolished to make way for a cement works. The only sign left of it today, is a ruined wall in the north east corner of the parish church yard.